A fire damaged a single-story house in the La Jolla area Thursday, but no injuries were reported. Photo via OnScene.TV. A fire damaged a single-story house in the La Jolla area Thursday, but no injuries were reported. 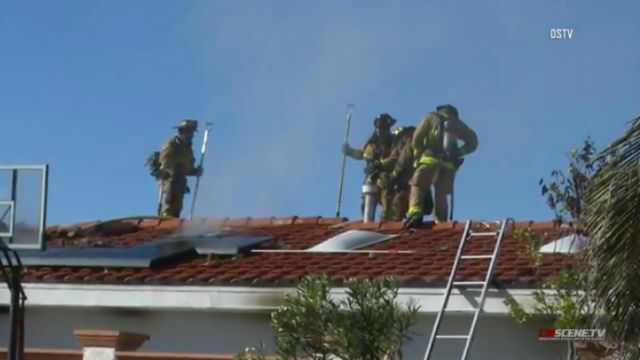 Crews responded to the blaze shortly before 9:15 a.m. at a single- story house in the 2200 block of Calle Guaymas near Cardeno Drive, San Diego Fire-Rescue spokeswoman Monica Munoz said. The 911 caller stated that no one was inside the residence when the fire broke out, Munoz said. Firefighters knocked down the flames shortly before 9:40 a.m., Munoz said.